Eleaf is a vape company based in Shenzhen China. The company started operating in 2011 and is now one of the most popular vaping brands in the world. They’re best known for their iStick series. The iStick mini was launched in September 2014. Several other variants of the iStick followed which further bolstered the reputation of Eleaf as a leading vaping brand. Their online shop is easy to use and offers a lot of information about their products. You can get your atomizers and mod kits from Eleaf. They also have coils and accessories. Their products have reasonable prices considering their great quality. Aside from the product information, their online shop also has a section for helping out their customers. It has video tutorials, manuals, tech info, and FAQs. If you’re new to vaping, this section of Eleaf’s website offers a wealth of information that can help you out. They also have a product authentication method. Just enter the serial number of your Eleaf product so you can check if you have the real thing and not a counterfeit. For this review, we’re taking a closer look at two of their latest and most popular products. This is one of the newer atomizers in Eleaf’s lineup. It comes in two variants, 4 ml and a 2 ml. Both variants are of the same dimensions and will fit your mod perfectly. You can get the iJust in 5 different colors: gold, silver, black, blue, and dazzling. I got the silver one and it looks great. The atomizer looks solidly built and the silver color complements the design. It made the atomizer look sophisticated. This makes it ideal for vapers who work in a corporate environment. The sophisticated look of the atomizer says a lot about the taste and preference of the user. It’s something that you won’t mind bringing showing off while meeting business partners or corporate honchos. One of the changes they implemented in this atomizer is the two coil heads that come with it. It uses two new EC Mesh coils. When you purchase the iJust, you get one EC-N and one EC-M coil. Each coil uses a different style of mesh. What this means is you get a bigger surface area. We love how the mesh coils provide better flavor and bigger clouds whenever we vape. In addition, the dual air inlets of the atomizer let in more air which further intensifies the flavor of any e-juice. We also like that we can disassemble all of the parts of the iJust. This makes cleaning the atomizer really easy. An atomizer can accumulate a lot of gunk when left uncleaned but this will never be an issue with the iJust. One thing that we didn’t like about this atomizer is the way the top cap gets too close to the filling hole. You’ll need to slide the top cap sideways to get to the hidden filling hole. This is pretty standard. However, even after sliding the top cap away from the filling hole, the top cap still sits pretty close to it. This can be an issue if you have a large bottle of e-juice. The mouthpiece will get in the way of the filling hole so you will need to remove the mouthpiece prior to refilling it. This doesn’t seem to be to big a deal if you’re refilling at home but it can be bothersome if you need to refill while on the go. 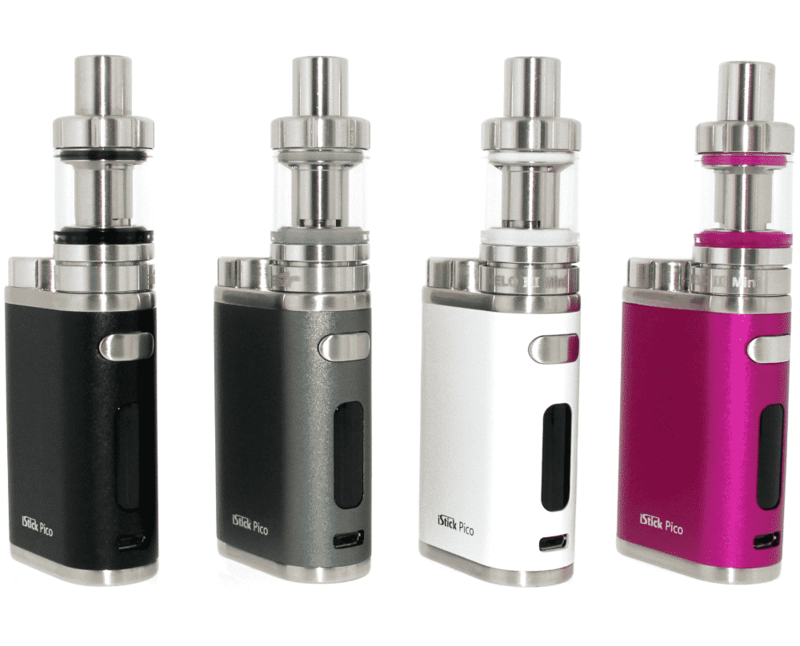 This kit by Eleaf is comprised of the iStick mod and the Ello Pop sub ohm tank. The Ello Pop tank comes with Dual mesh HW-M2 and HW-N2 coil heads. It has a top cap that you can slide open if you need a refill. The top cap has a built-in childproof lock mechanism which makes this kit ideal for vapers who have children with them. As for the capacity of the tank, it can hold 2 ml of e-juice. However, you can increase this capacity with the use of the bubble glass. This will allow you to carry enough e-juice to last you an entire day, even if you are a heavy vaper. Heavy vapers will also appreciate the adjustable airflow of this tank. You can use the airflow control ring located at the bottom of the tank so you can customize the airflow to suit your preference. As for the iStick mod, it requires 2 18650 batteries. This is a bit of a let down for me since most of the newer mods now use a single 18650. You can recharge your battery by using the built-in USB C charging system. Eleaf claims that this can quickly charge the battery. We haven’t tried it yet though since we prefer to recharge batteries with the help of an external charger. The mod comes in different designs and colors. They seem to have used a resin finish for the body of the mod. The actual designs are nothing to rave about. They add a touch of color to the mods but there’s nothing special about them. We’re also a bit concerned about the finish since it looks as if it can be easy to chip. As for the safety features of the iStick, Eleaf made sure that this mod has all of the protections available. It has overcharge protection and overcurrent protection. On top of these, this mod also comes with short circuit protection and reverse polarity protection. The mod uses an Avatar chip, which is the same chip used in the latest Eleaf mods. We found the menu of the iStick easy to navigate. We couldn’t find any Temperature Control settings though. We’re not sure if we’re just not finding it yet or if there really isn’t one. For more info about Eleaf, we recommend checking out their website.